Happy Monday! I cannot believe it’s already Monday, the weekends are flying by even quicker these days and I find myself a little less prepared for Mondays. 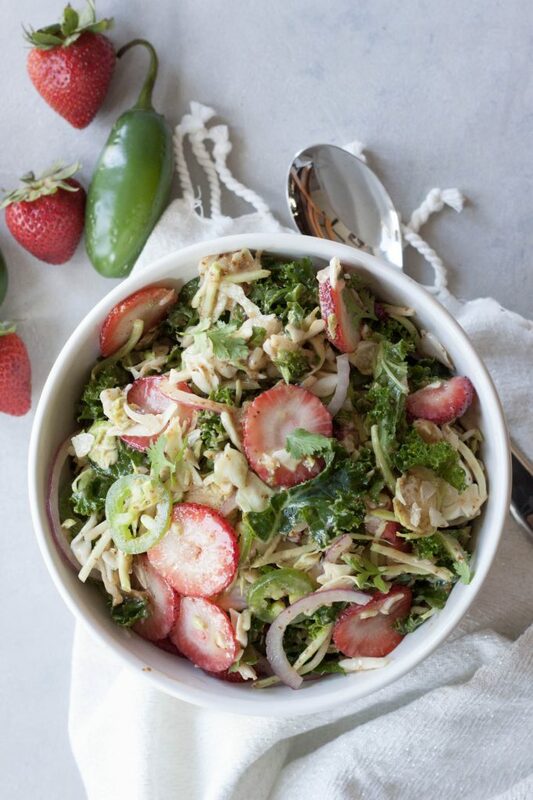 I can’t miss a Meatless Monday though and this week I have a good one, a Sweet and Spicy Strawberry Super Slaw that’s perfect for these last summer get togethers and cook-outs before summer ends. Not to be a downer but summer is quickly coming to an end. August snuck up on us and before you know it kids will be back in school and Pumpkin Spice Lattes will be everywhere you look. Yes really because talk of them and pumpkin has already shown up in my social feeds and I’m like wait, hold up, slow down!! I’m over here enjoying all the watermelon, berries, peaches, and produce coming out of our garden. 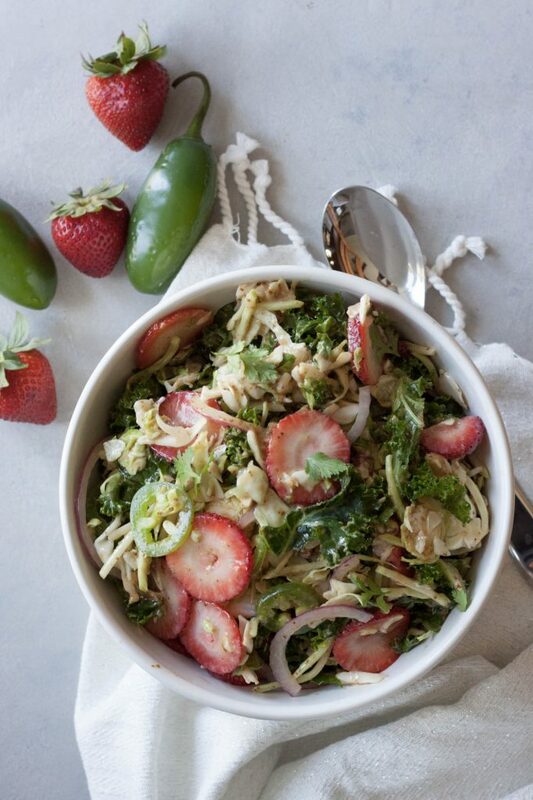 Savoring all the summer moments and foods this Sweet and Spicy Strawberry Super Slaw packs it all and is a great way to bring a flavorful healthy dish to the mix. It pairs well with so many things making it a wonderful side or potluck perfect. 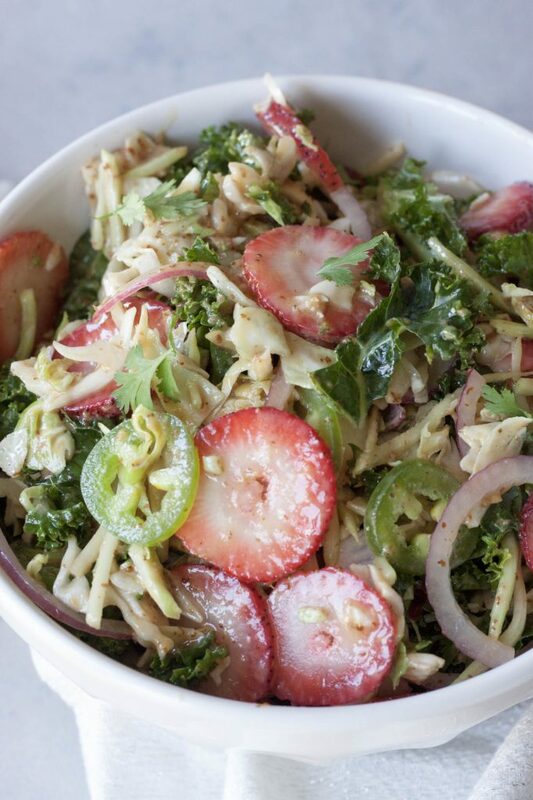 I like using a “superfood” slaw with a mix of kale, cabbage, and sprouts for maximum flavor, crunch, and nutrition! Adding strawberries while they’re still sweet and in season adds a twist and a pop of color. Liking things a little spicy adding in some peppers but if they aren’t your thing you can omit them or just remove the seeds for a little flavor and less heat. We like to add ones from the garden and even have a Fooled You variety with less heat that are great for adding for gatherings. As the summer berries change I’ll also be mixing this salad up with blueberries in place of strawberries. As I always say I like my recipes or creations to be inspirational and adaptable to your tastes and what you have. I do the same thing swapping out berries with what I have and what looks best at the store. Or what we are able to go out and pick locally since berry picking, and produce in general, is something we love to do. Weather it be our garden, friends, or going to a local orchard or even farmer’s market. Speaking of gardens and produce our garden has zucchini, cucumber, peppers, greens, and beets coming in like crazy! We will have tomatoes, beans, peas, and carrots soon. We also have a wall of herbs. My parents just gave us big ice cream pails of green beans and potatoes. We weren’t sure our garden would even get in this year so we are happy with what we’re able to grow since we got it in so late. We still haven’t finished it in terms of the walkways, watering system (need a new tank for watering ours blew a hole), and some finishing touches but we had to redo it from scratch removing what was there, building raised beds, and moving 28 yards of dirt. We’ll get there and while I miss our little white picket fence we had for years this will work much better than what we had. We did have the best crop of raspberries we’ve ever had! We had so many raspberries that we, along with family and friends, couldn’t pick them fast enough! There are so many things I love about summer and our garden is one of them. Not having a long growing season here in Minnesota you have to make the most of it while it’s here, just like anything. I hope you’re enjoying your summer and all the in season produce and time outside with family and friends. 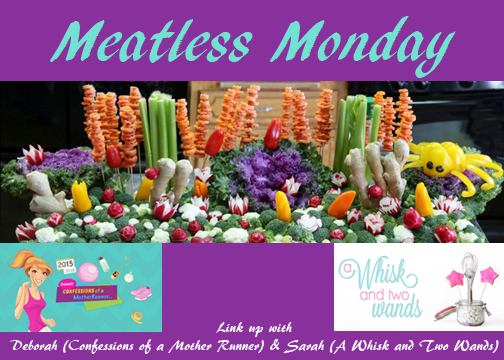 If you aren’t inspired by this recipe I hope you are by one of the many linked up in our Meatless Monday link below. My co-host Deborah and I would love to see what you’re making so please link up or comment below! 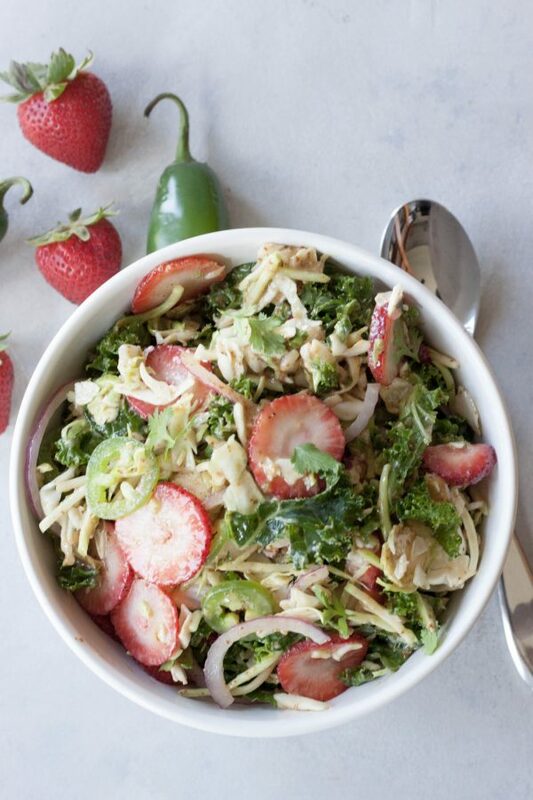 A flavorful twist on classic coleslaw with this nutrition packed Sweet and Spicy Strawberry Slaw. Gluten free and vegan so everyone can, and will, enjoy it! In a large bowl mix together oil, mustard, vinegar, and sugar until combine. Add cabbage mix, red onion, jalapenos, and cilantro and toss to coat and combine. Add strawberries and gentle toss. Assemble salad no more than 3 hours before serving to retain best texture. Substitute 1/2-2/3c blueberries for strawberries. I’ve recently become a huge fan of jalapenos! 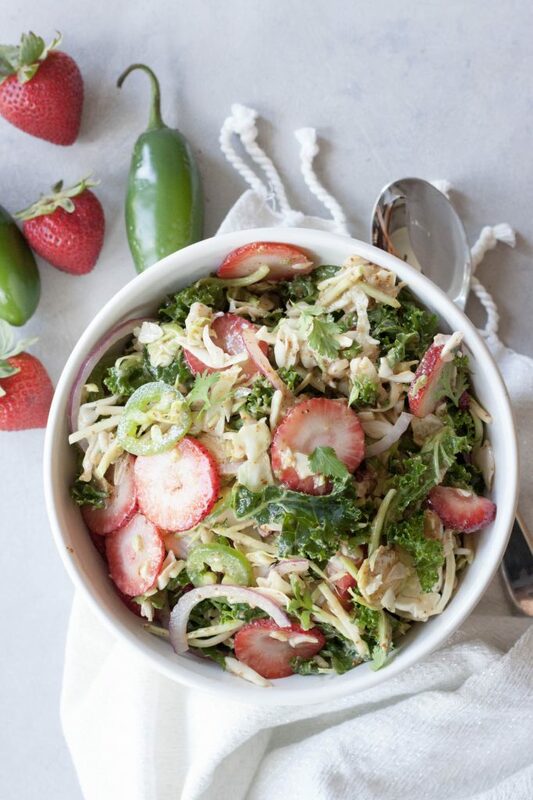 I always keep some shredded cabbage in the fridge to throw together little sides like these for dinnertime, I’m definitely adding this to my list! This is right up my alley! I have a strawberry-jalapeno salsa on my blog so you know I love this combo- so fresh and flavorful!